Are you looking for a cordless vacuum? Need something powerful but lightweight that can go for a long time without plugging it into a socket? Then the AirRam Mk2 by UK manufacturer Gtech.co.uk might be for you. In this article, we talk about AirRam features as a vacuum cleaner. We also refer to the latest coupon codes for Gtech that can save you money if you buy Gtech AirRam. Gtech launched the Gtech AirRam Mk2 as a versatile cordless cleaner. With significant upgrades, this is the right vacuum cleaner for most of your floors at home. The design of the Gtech AirRam Mk2 is comparable to other top end models of other brands such as those from Dyson. The Gtech AirRam Mk2 weighs 3.5kg, which makes it lighter than the vast majority of upright vacuums you will come across. 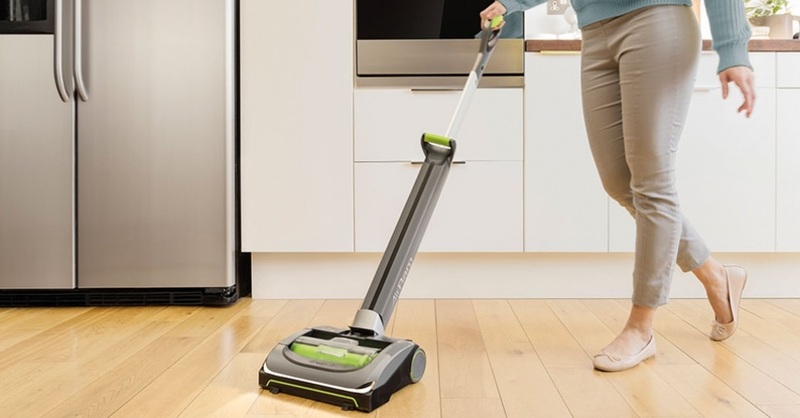 However, it is still a bit heavier than most stick vacuums – although this is an advantage if you are looking for something heavy enough to clean your floors while being adequately lightweight to lug around your home. Although the Mk2 is an upright cleaner, it is different from most upright models. Every attachment is packed within the base unit. It has a motorized brush bar to kick up dirt and push it into the bin through the sucking fan. The Gtech AirRam Mk2 isn't an actual vacuum cleaner. The cleanermoves on wheels (two large and two small) located underneath. The brush bar is also powerfully motorized, which means that the entire gadget can move forward without your having to push it. When you clean a hard floor, for instance, the AirRam Mk2 will glide over and pick all pieces and specks of dirt and dust. Other handy features include the dirt-removal mechanism, the power switch, the removable battery block, and new headlights. The company has also provided a guarantee for two years, so you should be good with the Gtech AirRam Mk2 for a while. The Gtech AirRam Mk2 does its job perfectly. Therefore, if you are looking for a gadget that will help you clean floors efficiently and effectively you should get this cleaner. To buy the Gtech AirRam Mk2 go to gtech.co.uk. The full cost should come to £199.00 – which is fair given the numerous handy features this cleaner boasts. Gtech discount codes are available online and will give you money off your purchase. Alternatively, using a Gtech voucher code you may get free delivery or a free spare battery. Gtech promo code “MN36” saves you £20 off your order. Also, Gtech offer code “HD35” also gives you £20 Off AirRam cleaners. These offers are not permanent as they do keep change over time. Your best bet to save on your purchase of a new AirRam cleaner is to check Google for the latest Gtech coupon codes.